Supposedly modelled on the crystal structure of an atom of iron, enlarged 165 billion times, the Atomium is partly a building, partly a sculpture. Taken all together, it is a remarkable construction. With nine stainless steel balls 18 meters in diameter, massive connecting tubes and supports, it stands 102 meters to the top of its antenna, which also does duty as a flagstaff. 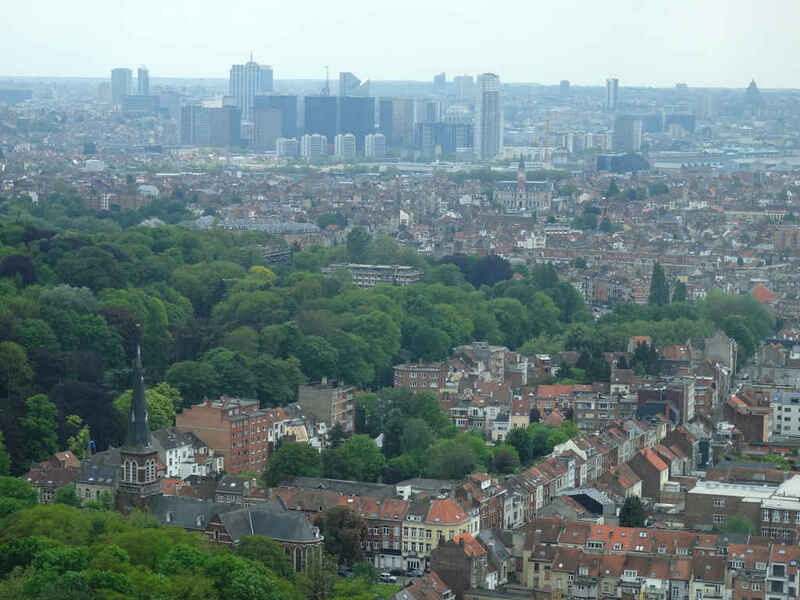 It broods on the horizon north from Brussels city centre, but you can only really see it when you are up high or when looking in the right direction from the trains to and from the International Airport. Until my recent visit, I’d never seen it up close. I was even unsure whether I would be able to find it when I exited the metro station at Heysel. I needn’t have worried. It’s very obvious. 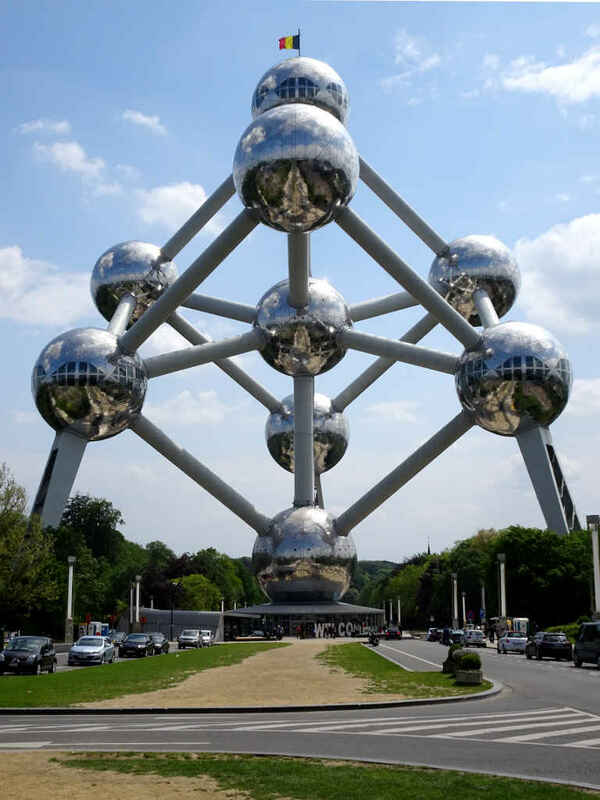 It was originally erected for Expo 58, the Brussels World Fair in 1958. Apparently, it was intended to be for Brussels what the Eiffel Tower is for Paris. Many Belgian seem still under the impression that it is equally famous and just as great a tourist attraction. But it does stand as a monument to the future as conceived in the 1950s. A future familiar from the covers of magazines like Popular Mechanics or Galaxy Science Fiction, or SF film posters and stills. A future from when atomic power seemed like an unalloyed Good Thing. 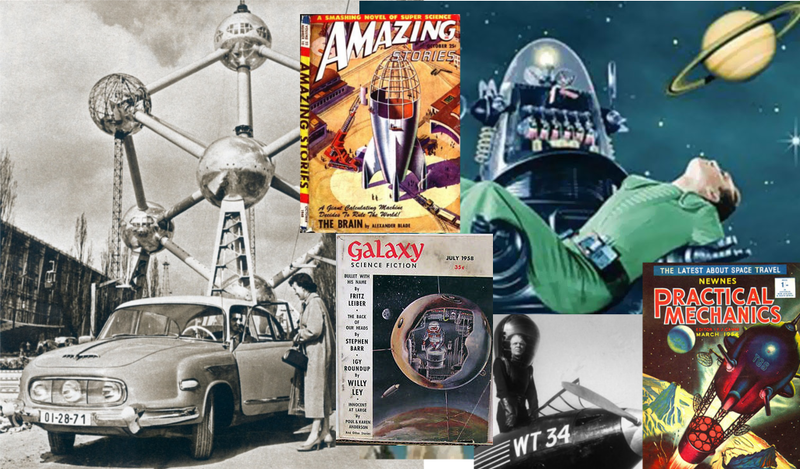 Clockwise from left: The Atomium under construction – a French magazine, 1957; front cover of Amazing Stories c.1960; still from Forbidden Planet, 1956; front cover Practical Mechanics 1954; still from The Shape of Things to Come 1936; front cover Galaxy Science Fiction 1958. The Atomium and I are roughly the same age. 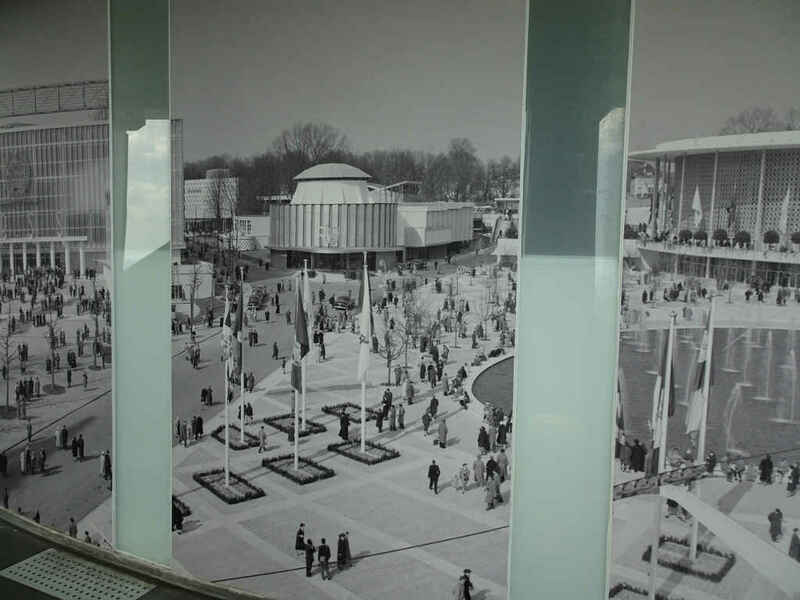 It opened, along with Expo 58, in April 1958. I first put in an appearance in July of the same year. 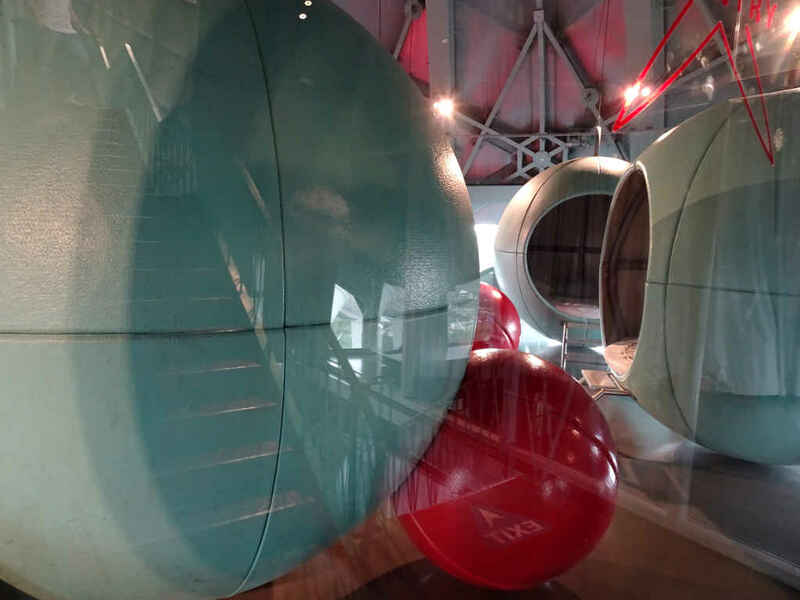 My childhood was imbued with the same futuristic designs that inspired the Atomium’s creators, design engineer André Waterkeyn and architects André and Jean Polak. Clearly a design perspective that hung on to inspire the concept of the future of the 1960s. When I talk about time travel in respect of visiting the Atomium, I’m talking partly about travelling back in time to the futuristic designs that thrilled my childhood and illustrated my earliest experience of science fiction. I got something of the same sensation when I visited the Cosmonauts exhibition at the Science Museum in London last year. 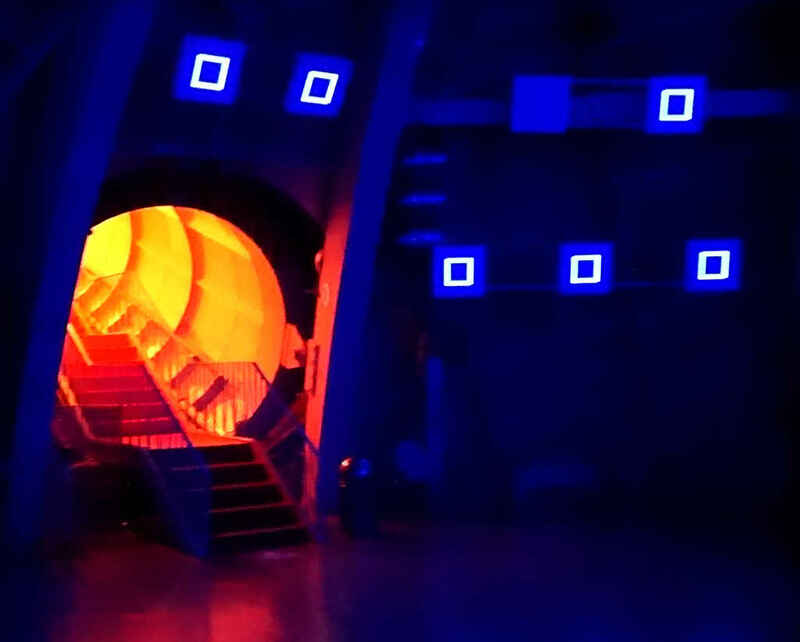 The Cosmonauts exhibition took the story from the fantastic visions of the original space pioneers to the gritty reality of modern space flight. (Hopefully not literally gritty, to be sure.) However the Atomium seems suspended in an alternate time line. Perhaps because the structure simply wasn’t intended to have a real purpose. (It isn’t a spaceship, however much it looks like one.) So visiting is a form of time travel that takes you back (takes me back anyway) to rediscover the future vision of the original creators. 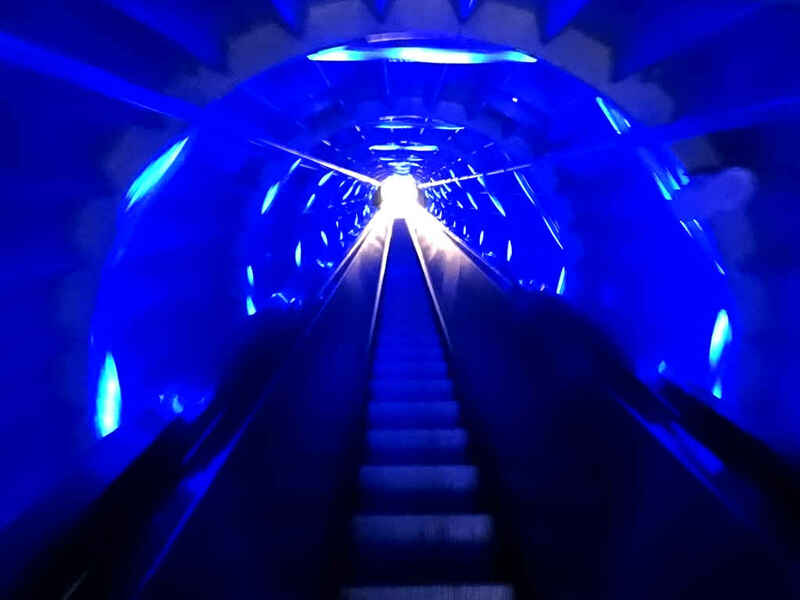 On the very slow escalators, the light show – a more recent addition I’m sure – deliberately contributes to this sensation. 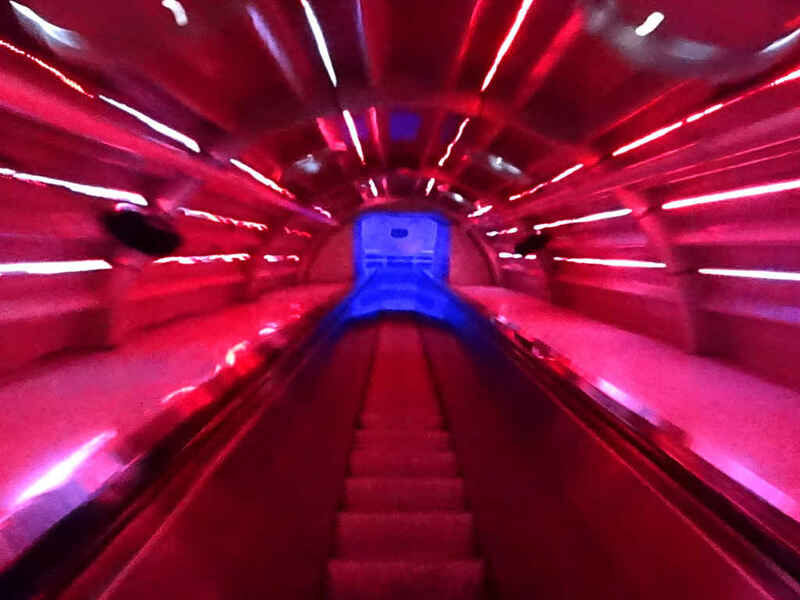 Apart from making it feel like you are moving a lot faster than you are, they also hark back to cinematographic images of travelling through wormholes in space, along turbo-lift shafts or spacecraft corridors. 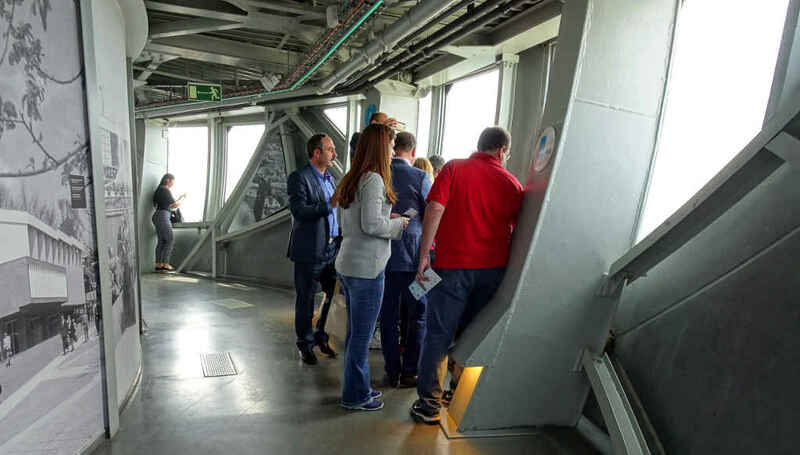 Up in the top sphere of the Atomium, the lower half has an observation gallery with great views over Brussels. The upper half is a restaurant. There may be good views there too, but as it’s a restaurant, not a café, I wouldn’t know. The Atomium itself costs €12 entrance fee for one adult, which I thought was OK, but I wasn’t prepared to buy a whole meal just to see the view one flight higher up. There is a café, but it’s at ground level and outside the building. I passed on that. One of the spheres (off limits to visitors when I was there) was reserved for children. Apparently schools can come to an arrangement with the Atomium and bring a class here to sleep over in specially designed spherical beds. It sounds like a great idea. I grabbed a photo of the beds through the reflections on the door. What else to add? 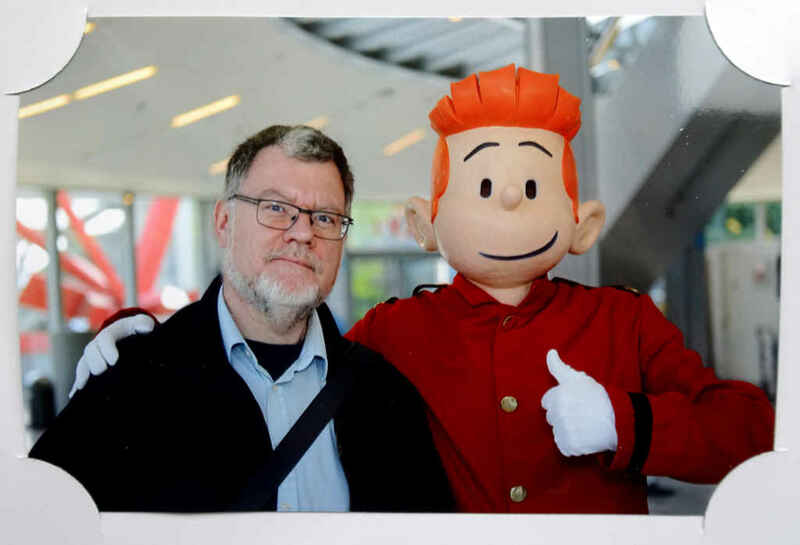 Oh yes, as I entered the Atomium on the ground floor I had my photo taken with a mascot. I didn’t choose this; it was nothing I could avoid. On the way out I was invited to pay another €7 for a copy of the photo. Well, I paid, but I still can’t work out what this was all about. 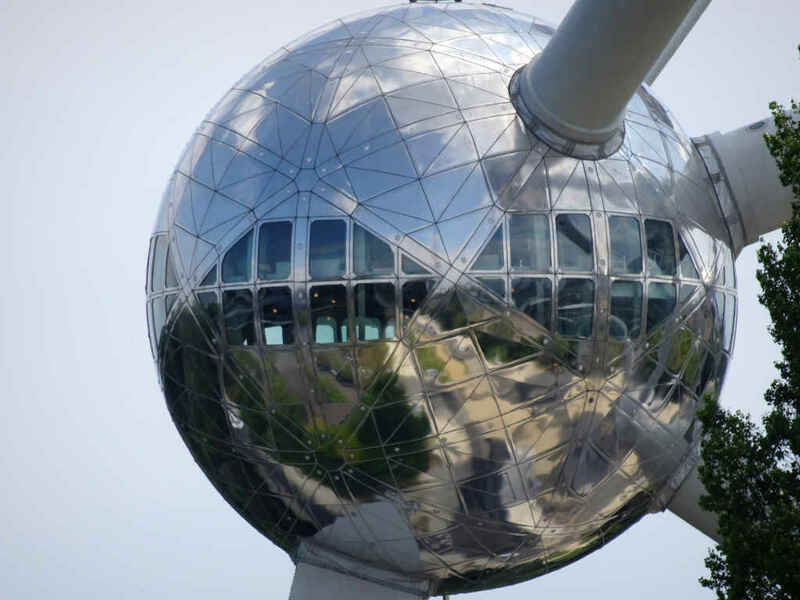 The mascot doesn’t appear anywhere on the Atomium web site, so I’m guessing it was all in aid of advertising something else – but I have no idea what. I rather think that counts as an advertising failure. Here’s another time travel photo for you. I should also say that, escalators aside, the Atomium also has some serious flights of stairs to climb. Down as well as up. In the 1950s the future did not include physical disability. Or perhaps anti-gravity suits and jet-packs were going to make walking superfluous. Well, that was that future. In the real world the Atomium is not friendly to anyone with restricted mobility. And even if you don’t find long stairs a challenge, your legs may well feel the Atomium effect the day after. Mine did. Hmm… Not all the photos of course, the images in the collage are sourced from various places on-line – mostly e-bay.